Listen up, all you Masters of the Grill: Cleaning everyone’s favorite cooking device just got awesome-easy — ROBOTIC-easy with Grillbot. That’s right: No more stabbing yourself with a thousand tiny metal bristles or scrubbing your knuckles off! The Grillbot is the dream gizmo of everyone who loves to grill but hates to clean up the darned things. Grillbot comes standard with three brass bristle brushes, which it uses to blast the grate of your grill for up to 30 minutes. The brushes are dishwasher safe and easy to remove and reinstall. 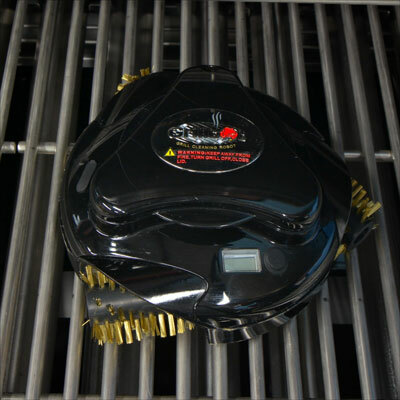 Grillbot offers stainless steel brushes that are a bit more durable than the brass brushes. (Stainless steel brushes can handle the tougher jobs without wearing out as quickly.) You can purchase them from the Grillbot website. Grill your favorite meat and veggies and enjoy! Allow your grill to cool down to at least 250 degrees Fahrenheit (cooler is better). NEVER use the Grillbot over an open flame! Place the Grillbot on the grill’s grate. Press the button on the Grillbot once for a 10-minute cycle, twice for a 20-minute cycle, and three times for 30 minutes of grate-grinding fun. Grillbot will begin cleaning after a 5-second delay, to give you time to close the grill’s lid before it gets started. Grillbot will stop when the cycle is complete and will emit an alert to inform you it’s done its job. Credit: Image courtesy of Grillbots. Be sure to close the top of the grill! Grillbot will start churning away on your grate five seconds after you set the timer. When it starts to work, there’s very little shielding to keep the bits and pieces of grill-gunk from flying in your eyes. Hopefully, someday the people at Grillbots will come up with a device that cleans the ashes for charcoal grills. Until then, you’d be hard-pressed to find a better Father’s Day gift than this puppy. Hint, hint, wink, wink.